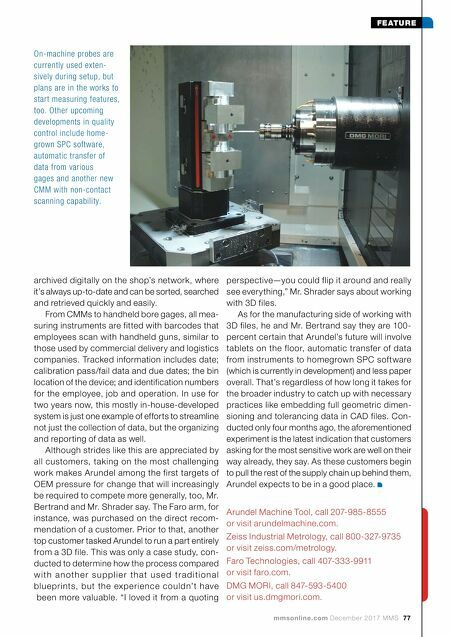 mmsonline.com December 2017 MMS 77 FEATURE Arundel Machine Tool, call 207-985-8555 or visit arundelmachine.com. Zeiss Industrial Metrology, call 800-327-9735 or visit zeiss.com/metrology. Faro Technologies, call 407-333-9911 or visit faro.com. DMG MORI, call 847-593-5400 or visit us.dmgmori.com. archived digitally on the shop's network, where it's always up-to-date and can be sorted, searched and retrieved quickly and easily. From CMMs to handheld bore gages, all mea- suring instruments are fitted with barcodes that employees scan with handheld guns, similar to those used by commercial delivery and logistics companies. Tracked information includes date; calibration pass/fail data and due dates; the bin location of the device; and identification numbers for the employee, job and operation. In use for two years now, this mostly in-house-developed system is just one example of efforts to streamline not just the collection of data, but the organizing and reporting of data as well. Although strides like this are appreciated by all customers, taking on the most challenging work makes Arundel among the first targets of OEM pressure for change that will increasingly be required to compete more generally, too, Mr. Bertrand and Mr. Shrader say. The Faro arm, for instance, was purchased on the direct recom- mendation of a customer. Prior to that, another top customer tasked Arundel to run a part entirely from a 3D file. This was only a case study, con- ducted to determine how the process compared w i t h a n o t h e r s u p p l i e r t h a t u s e d t r a d i t i o n a l blueprints, but the experience couldn't have been more valuable. "I loved it from a quoting perspective—you could flip it around and really see everything," Mr. Shrader says about working with 3D files. As for the manufacturing side of working with 3D files, he and Mr. Bertrand say they are 100- percent certain that Arundel's future will involve tablets on the floor, automatic transfer of data from instruments to homegrown SPC software (which is currently in development) and less paper overall. That's regardless of how long it takes for the broader industry to catch up with necessary practices like embedding full geometric dimen- sioning and tolerancing data in CAD files. Con- ducted only four months ago, the aforementioned experiment is the latest indication that customers asking for the most sensitive work are well on their way already, they say. As these customers begin to pull the rest of the supply chain up behind them, Arundel expects to be in a good place. On-machine probes are currently used exten- sively during setup, but plans are in the works to start measuring features, too. 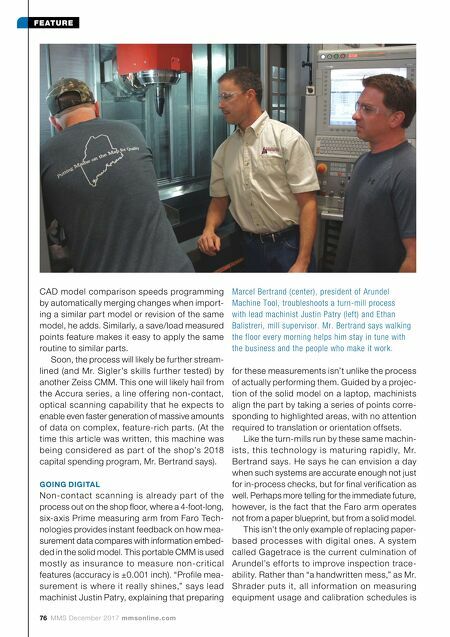 Other upcoming developments in quality control include home- grown SPC software, automatic transfer of data from various gages and another new CMM with non-contact scanning capability.